Who's Got Game? : The Ant or the Grasshopper?, The Lion or the Mouse?, Poppy or the Snake? Generation after generation, classic fables, folklore, and myth remain popular because they quicken the imagination of listeners of all ages. 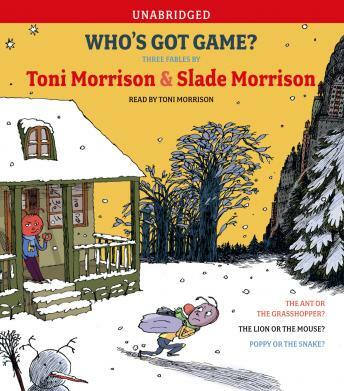 We, the creators of Who's Got Game?, were inspired by the wonder of Aaesop's fables -- their vitality, their endless demand for new interpretations. In our versions the original stories are opened up and their moralistic endings re-imagined: the victim might not lose; the timid get a chance to become strong; the fool can gain insight; the powerful may lose their grip. ANYTHING CAN HAPPEN. More than a play on these beloved fables, Who's Got Game? is AESOP LIVE!